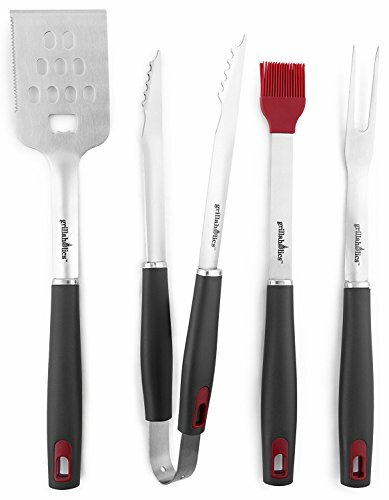 Grillaholics BBQ Grill Tools Set!! What A Deal!! PROFESSIONAL DIFFERENCE - The name says it all: Grillaholics. We're addicted to this stuff! Being the master grillers that we are, we bring you a premium heavy duty stainless-steel bbq set. With our beautifully crafted grilling accessories, not only will you be a master of the grill, but you'll look like one too! PREMIUM MATERIALS - Made from professional grade heavy duty stainless-steel with long non-slip plastic grips, Grillaholics Grill Tools help you conquer your food without grilling your hands. With our heavy-duty construction you'll never have to worry about your grill tools rusting, bending, or breaking again. LIFETIME GUARANTEE - Every Grillaholics product is backed by a full 100% MONEY BACK LIFETIME GUARANTEE. You can try Grillaholics Grill Tools completely RISK FREE. If our product isn't for you, simply contact us and we'll make it right. Click the Add to Cart button now. Consider getting TWO - one for you and one for your very best friend.